Osteria Mozza has done away the white linens (FINALLY) and now presents us a relaxed ambience for weekend lunch. On the newly introduced Weekend Lunch menu is a selection of food that epitomizes true Italian cooking. Did I mention there is breakfast food too? Weekends have definitely been made sweeter! 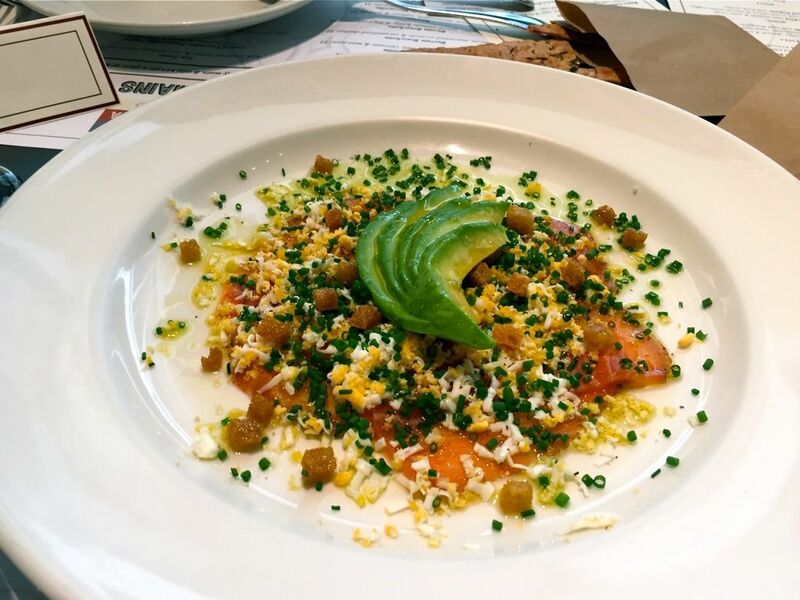 A table favourite is the Housemade Gravlax ($22) with lemon, chives, shaved eggs, croutons and avocado. All the favourite breakfast ingredients tossed in beautiful flavours. A clean and healthy breakfast! I love the salads from sister restaurant, Pizzeria Mozza, so I do have expectations for the greens here. I am pleased to declare that Butter Lettuce ($21) did not disappoint! 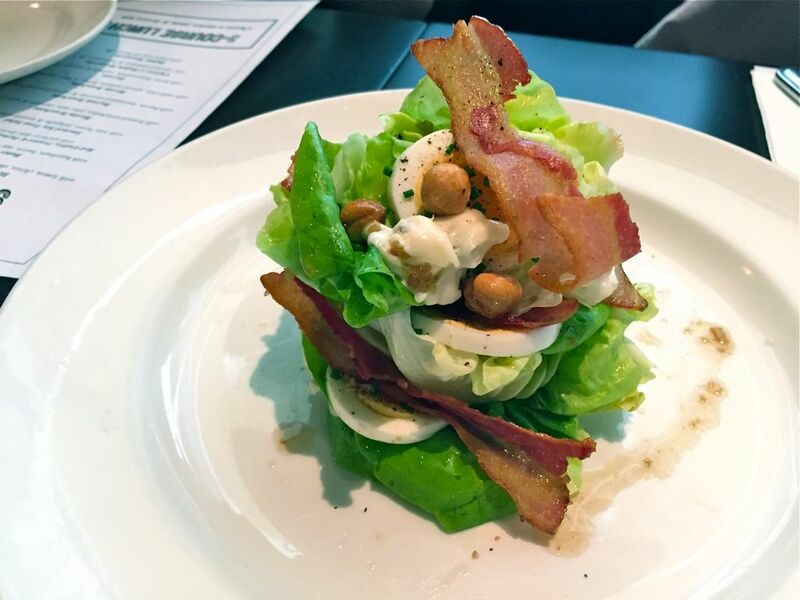 A classic dish, the crisp leaves of greens, balls of toasted hazelnuts, slices of hardboiled egg and long strips of blushing bacon are arranged like a salad bouquet, wrapped with creamy gorgonzola dolce and dressed with vinaigrette. Cheese lovers will love the Bufala Mozzarellas! (Even if you are not, a taste of this might just convert you into a fan!) Hand-pulled and served with traditional and simple ingredients are the Caprese of Bufala Mozzarella ($25) with vine ripened tomatoes and basil pesto; and Bufala Mozzarella ($28) with Prosciutto di Parma. 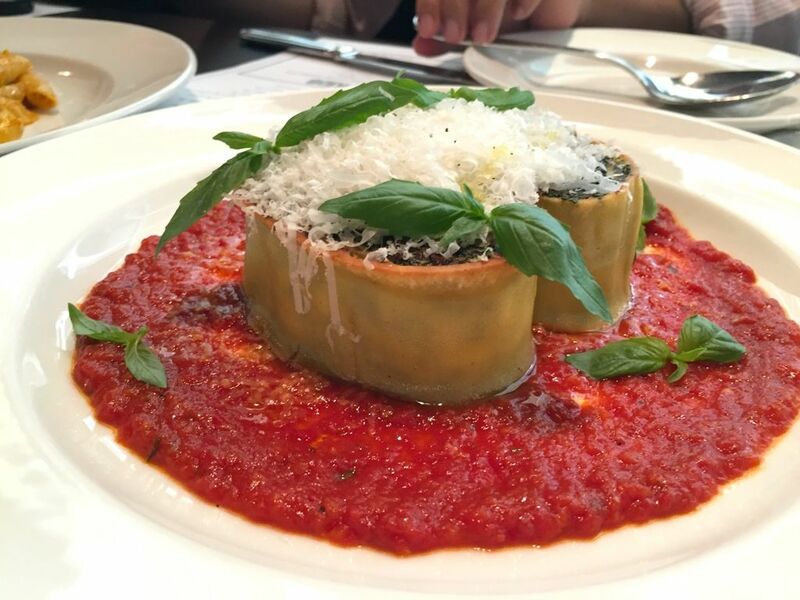 Bursting with fresh and natural flavours of Italy, I was teleported to The Boot. Rich in flavours, the house-made pastas are items that cannot be missed. 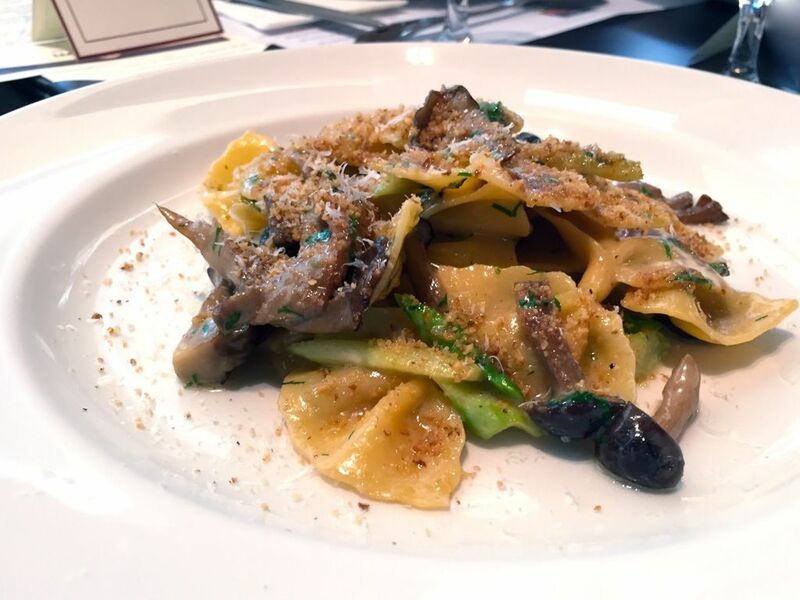 A dish with wild mushrooms, asparagus and walnuts, the Farfalle ($23) is delicious with its nutty flavors. The big bow-ties have an addictive bite to them and before you know it, the plate is cleaned. Osteria Mozza does its Bolognese well. 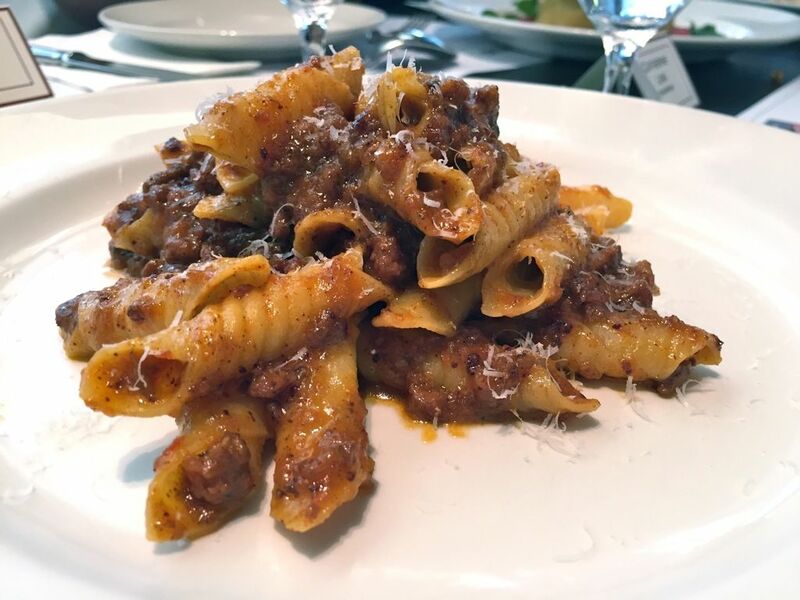 Garganelli ($24) with ragù Bolognese is a comforting dish that throws endless juicy ragù punches as the tubular homemade version of penne holds just the right amount of sauce. One can only feel the Bolognese love in every mouth. Most people would have probably not heard of Rotolo ($24). Kind of like a rolled up lasagne, except better, as it is fat with ricotta, spinach and tomato. It has been gently poached for 45 minutes before being cooled, portioned and placed into a pan to be seared on each side, and finally heated in the oven. Great way to eat the spinach, especially for the kids. Popeye would definitely love the Rotolo! 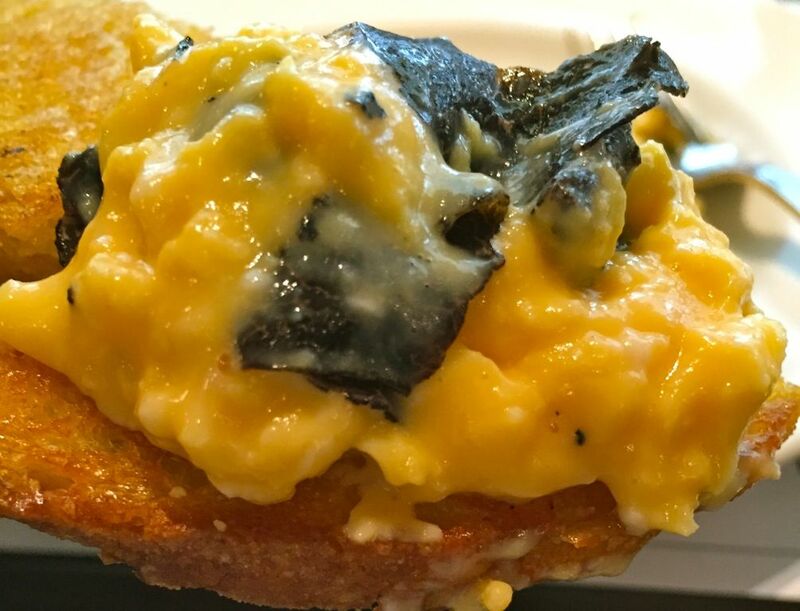 Some breakfast indulgence for real- Soft Scrambled Eggs ($48) with shaved winter truffles and crème fraîche! Breakfast check. Indulgence check. 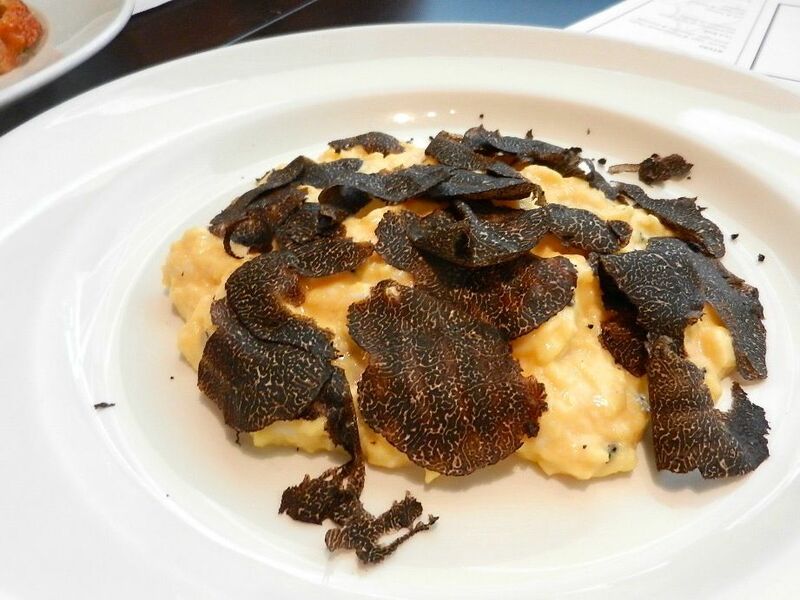 The aroma of the truffles will leave you drooling, so shut up and tuck in! Step aside Mr. Eggs Ben, Eggs and Polpette ($24) has won our hearts (and tummies). 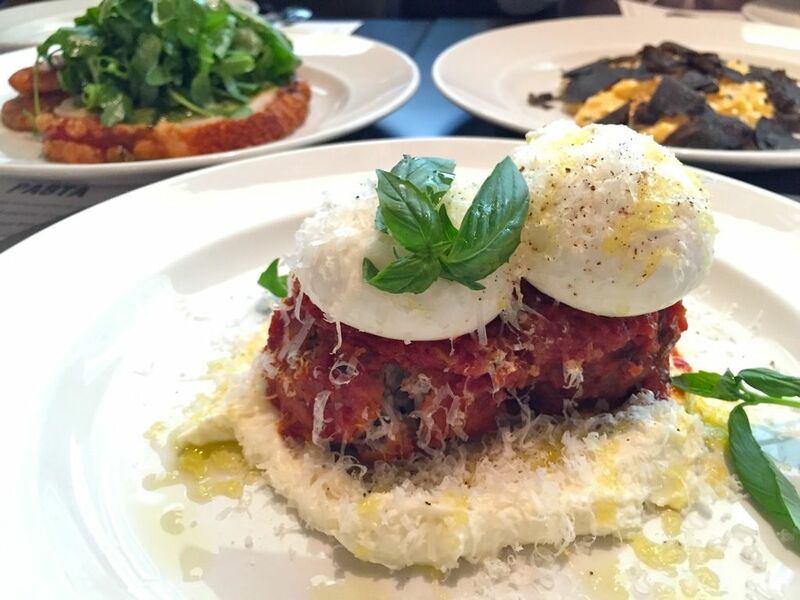 Two white fluffy-looking poached eggs cushioned on twin ginormous juicy meatballs with pecorino, parmesan and garlic, on a bed of fresh ricotta that is made in-house. On a no carb diet? THIS IS IT. I’ll have this Cloudy with a Chance of Meatballs (or whatever R21 version) dish every day. Need more meat proteins? 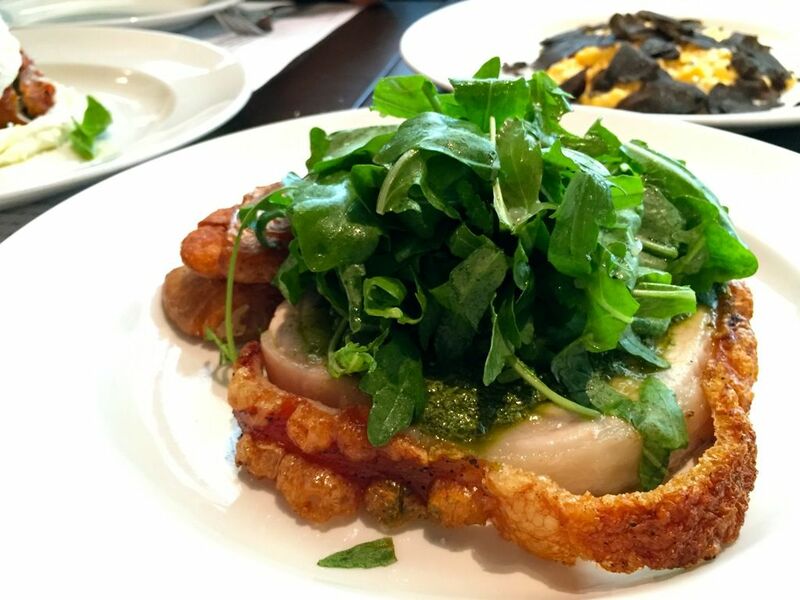 Psst…Tuscan Roast Pork ($30) has good crackling! 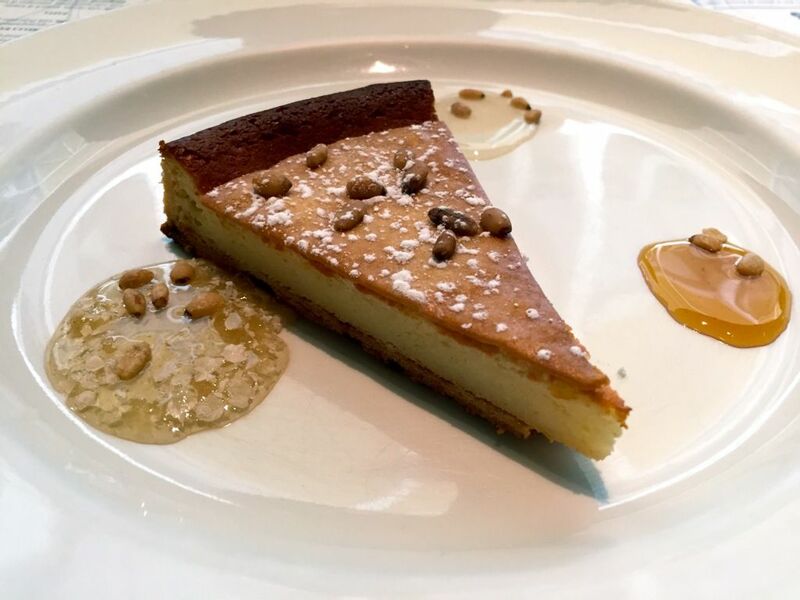 Even if you are stuffed from all the hearty dishes, you must have a taste of Torta Della Nonna! A tart of three —cream, mascarpone and goats— cheeses, this Grandma’s pie is brimming with love. Topped with a crisp pine nut biscuit and served with honeycomb, acacia and chestnut honeys, this slice is a sweetheart. Expect classic Italian dishes prepared with the freshest ingredients that ooze with authentic flavours at Osteria Mozza. Colours of Italy. Nothing less.